The Christmas season does not officially begin for me until I’ve had the opportunity to visit my old friends, the Griswold family. Christmas Vacation, and the other Vacation films, have been staples of my re-watch rotation for my entire life. This year I had the special privilege of getting myself into the Christmas spirit with a trip to see Christmas Vacation on the big screen, at my favorite theater! The Redford screened the film on December 5 and 6, one showing on Friday night and two showings on Saturday (as usual) — I attended the 2 pm showing on the 6th. This was a special trip to the Redford for a couple of reasons. It was my first visit this year since they’ve “decked the halls” for the holidays, and the decorations made the theater even more beautiful than usual! A large model train system, complete with local landmarks (including a mini Redford Theatre!) could be found in front of the stage, as well as a giant, brightly-decorated tree, and wreaths. In the lobby, visitors could have their picture taken with Santa, and Cousin Eddie shirts could be purchased. In addition to the decor, the screening was also special because it was my first time seeing a newer film at the Redford. In the past, I’ve mostly attended silent screenings and films from the ’40s/’50s. I was pleasantly surprised to find that a vintage cartoon short was still screened prior to the film, despite Christmas Vacation‘s 1989 release date. What a great way to introduce audiences interested in newer movies to a delightful form of classic entertainment, and to give the true movie house experience! 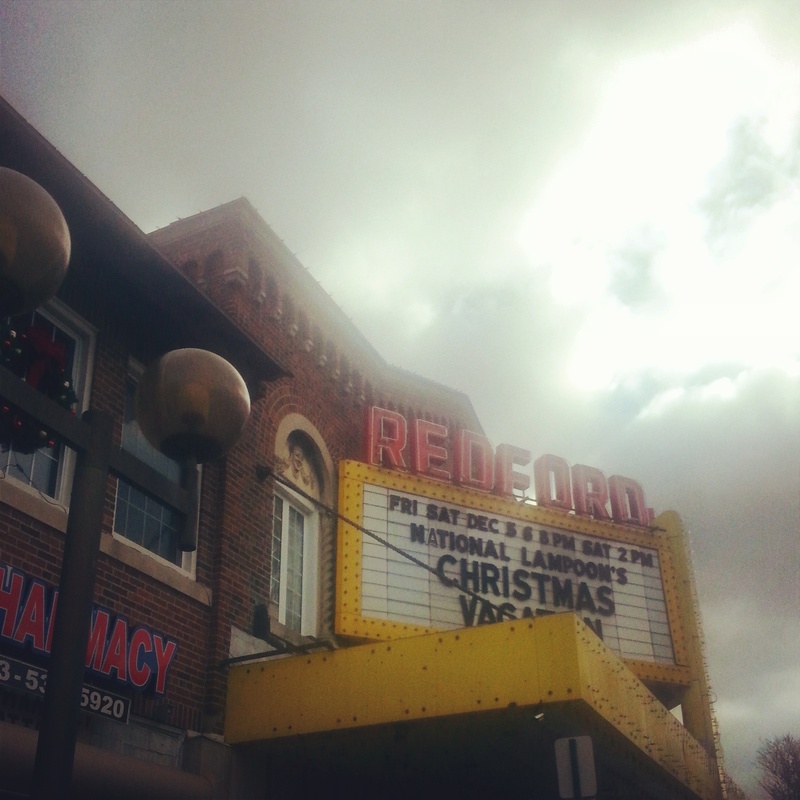 The short paired with Christmas Vacation was probably my favorite short I’ve seen at the Redford. It’s a version of Rudolph the Red-Nosed Reindeer that I was previously unfamiliar with, estimated by The Big Cartoon Database to have been released in 1944. And boy, is it ever a kooky telling of the Rudolph tale. Bipedal deer with limbs like spaghetti?! Santa’s sleigh encountering an airplane?! It’s a highly amusing short and got a lot of laughs out of the Redford audience. For your viewing pleasure, I was able to track it down on YouTube and have posted it above — but prepare yourself, for it is absolutely suited to the Classics of the Corn Hall of Shame. Along with the short film, an organ concert by Gil Francis kicked off the show. Francis also performed during the intermission. Lovely Christmas tunes from that beautiful Barton organ put the crowd in a cheerful mood. As for the film, Christmas Vacation is one that I’ve seen about a million times. But, as I’ve learned through my frequent attendance of old movie screenings, there’s nothing quite like seeing a film you love on the big screen. I noticed so many things about the film that I’d never noticed before, or at least didn’t remember from last year’s viewing. Chevy Chase’s facial expressions are golden in this film, which is something I’ve always recognized, but they bring even more laughs when that face is blown up on a couple-dozen-foot-tall screen. It was also a treat to watch the film with a very enthusiastic (LOUDLY enthusiastic) audience. Another wonderful afternoon spent at the Redford, and there will certainly be plenty more to come. The early 2015 schedule is looking pretty stellar (ALL ABOUT EVE! GONE WITH THE WIND! SPELLBOUND! ), so expect more accounts of Redford screenings on TMP in the new year! 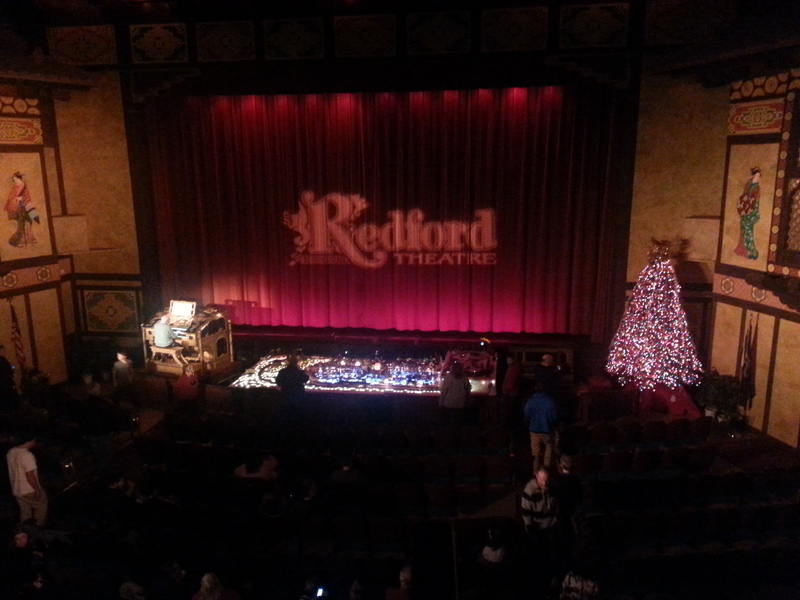 Another cool visit to the Redford! I know what you mean about watching favorites on the big screen: in the summer it was Jaws, and a few months ago it was Ghostbusters. Jaws had a packed house, and it was cool to have so many people be so enthusiastic over it. And I do like Christmas Vacation, too…I’ll have to rent that one soon. Ghostbusters was a lot of fun to see at my local multiplex! I believe the Redford played that recently, too (October, maybe? ), but I didn’t go since the screenings were only a few weeks apart. They’ve been mixing up the schedule with more frequent “modern classics,” which I have no problem with — they’re just as fun to see, and they help keep the doors open. Those modern classics are especially fun when the prints are perfect; both Jaws and Ghostbusters had Blu-ray quality prints (actually, they may have been Blu-ray projected screenings, now that I think about it). Still, I wish I had a place like the Redford here!